Open Ventilation System (OVS™) Cassettes are manufactured to the highest quality. 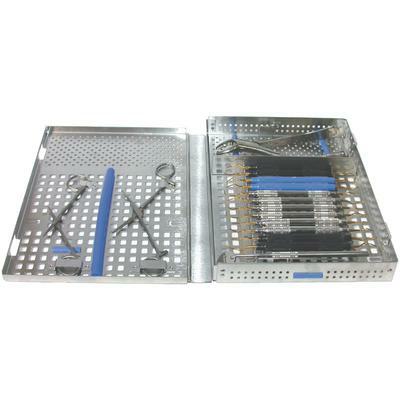 The double-hinge design allows for easier visibility of instruments while offering space savings within the tray. OVS™ Cassettes are made from a very durable stainless steel and have a unique flow-through design that allows maximum circulation for efficient ultrasonic cleaning. The cassettes are equipped with sturdy instrument racks that keep instruments in place during sterilization. They also feature a push-button latch for easy open and close operation.